I was actually going to call these Scrappy Potted Hearts because the hearts are made with leftover scraps; fabric from a quilt, a piece of a recycled sweater and a plaid that was used to make a doll skirt. I picked up the little red flower pots over a year ago on clearance for something like $0.25 (because, you know, I’d find something to do with them). The “stems” are just wooden coffee stirrers I grabbed at a coffee shop with a Christmas ornament in mind that never got made. I think they turned out quite sweet and really this is one of those projects that can be totally different based on the fabrics you use. I wanted different textures, but I think it would be really fun just in different quilting patterns. 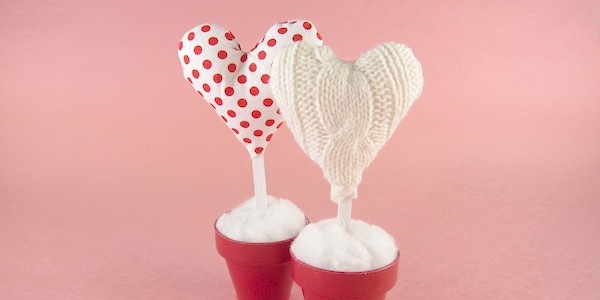 Or you could knit up some hearts. Or do the hearts in a plain muslin and let your kids decorate them with fabric markers, what a great Valentine for grandparents. 1. Create heart patterns with the paper. Make sure they are an appropriate size for your pots. Use the patterns to cut the hearts from your fabrics. 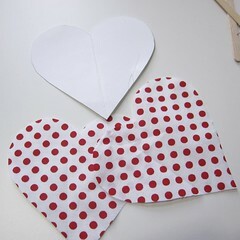 You’ll need two matching hearts pieces for each finished heart. 2. 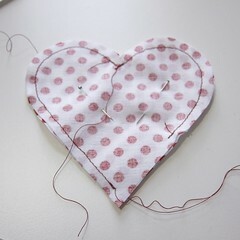 With the right sides together, sew each heart together either with a sewing machine or by hand. You want to leave a little opening at the bottom for the stem and one on the side to turn the heart and stuff it. 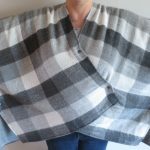 With my plaid heart I decided to sew it wrong sides together so that the seam allowances were on the outside. This fabric is such an open weave turning it would have made a mess and I liked the look of the fringed edges. 3. Turn the hearts right side out. Stuff. Sew up the opening on the side remembering to leave a little opening at the bottom for the stem. 4. Paint the coffee stirrers white. Let dry. 5. Put the styrofoam inside your pots. I cut down some balls I had laying around to fit. Two were a little loose so I secured them in place with styrofoam glue. 6. Insert the stirrers into the hearts. Decide how tall you want them to be in the pots and trim as needed. I found the cut easily with scissors. 7. 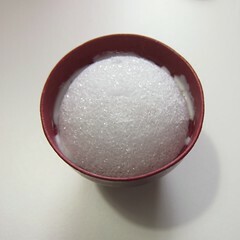 Press the stem into the center of the styrofoam as straight as possible. I then took it back out, put some glue on the end and reinserted it, just to keep things secure. 8. 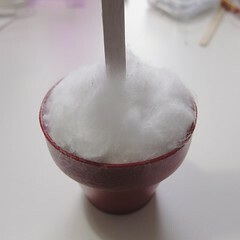 Cover the styrofoam with some cotton or roving. Glue into place. I went with white because Valentine’s Day is still snowy here, but a green roving would make it look springy. Or you could go more natural and use a floral moss. These come together so fast you can easily make a whole garden of them! 6 years ago by Kat in Craft Projects , Crafting with Kids , Crafts , Holiday , Projects , Sewing Projects , Valentine's Day | You can follow any responses to this entry through the RSS feed. You can leave a response, or trackback from your own site. I have just spent 2 hours cleaning up my craft area and ruthlessly throwing out small scraps. Now I’m eyeing up my trash bag and wondering if I should find somewhere to keep it ‘just in case’. But no. My house really is too tiny to store anything that isn’t absolutely necessary. 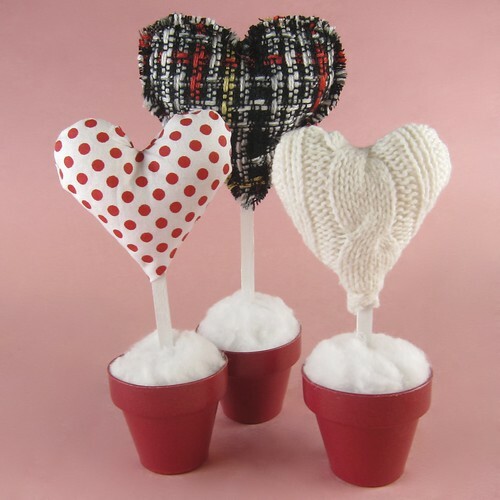 Hi, Thought you might like to know that this tutorial as been plagiarised (http://craftstutorials.com/potted-hearts/) as mine was (http://www.nexttonicx.com/blog/?p=5497). I’m seriously unimpressed and have lodged a complaint with Adsense for violating their policy with regards to copyright infringement. You might want to do the same thing too. Thank you for the heads up. I’ll look into it. Thanks for another cute project idea!